Abu Dhabi - Mubasher: The UAE Minister of State and Group CEO of the Abu Dhabi National Oil Company (ADNOC), Sultan Ahmed Al Jaber, has met the Japanese Minister of Economy, Trade, and Industry Hiroshige Seko. The meeting is aimed at exploring investment opportunities offered by ADNOC’s upstream and downstream growth plans and constitutes a part of a series of meetings aimed at strengthening Adnoc’s relations with Japan’s energy sector, according to an official statement. “For more than four decades, the UAE and Japan have enjoyed a deep-rooted and successful strategic relationship, underpinned by long-standing energy partnerships,” Al Jaber commented. 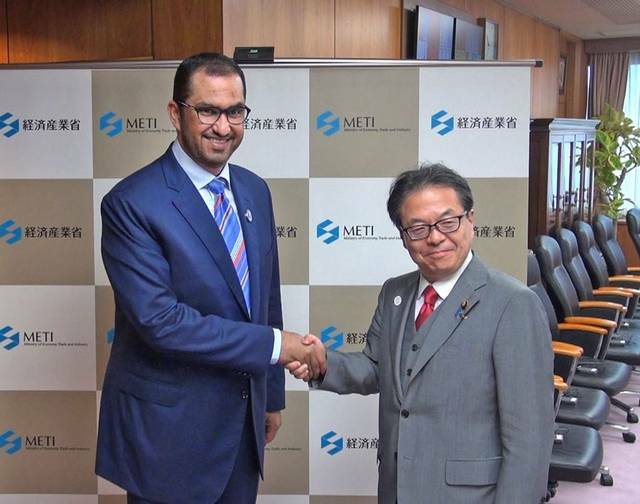 Following his visit with Seko, Al Jaber scheduled to hold a meeting with the chairmen of Softbank, INPEX/JODCO, and JERA, the statement revealed. “As we accelerate our focus on the increasing energy needs of Asian economies, such as Japan, ADNOC is introducing new partnership and investment opportunities across our integrated Upstream and Downstream operations,” Al Jaber said. The UAE is the second largest crude oil exporter to Japan after Saudi Arabia. In 2017, Japan’s oil imports from the UAE recorded AED 57.3 billion ($15.6 billion), according to the Japan External Trade Organisation (Jetro).